The Brandeis University Emergency Medical Corps' (BEMCo) goal is to ensure the health and safety of all university students, faculty, staff and visitors while on campus. As the providers of emergency medical services (EMS) on this campus, it is our organization’s commitment to provide our members with the highest caliber of medical education, so they can serve the university with excellent patient care. BEMCo pledges to continue its tradition of providing a venue for students to serve their community and grow as leaders within the Brandeis community. We believe EMS is a unique and distinct public service. As a fully student-run organization we will stay committed to ensuring proper collaboration and unity in all that we do and promise to conduct all aspects of our business with integrity while adhering to the ethical standards of our profession. 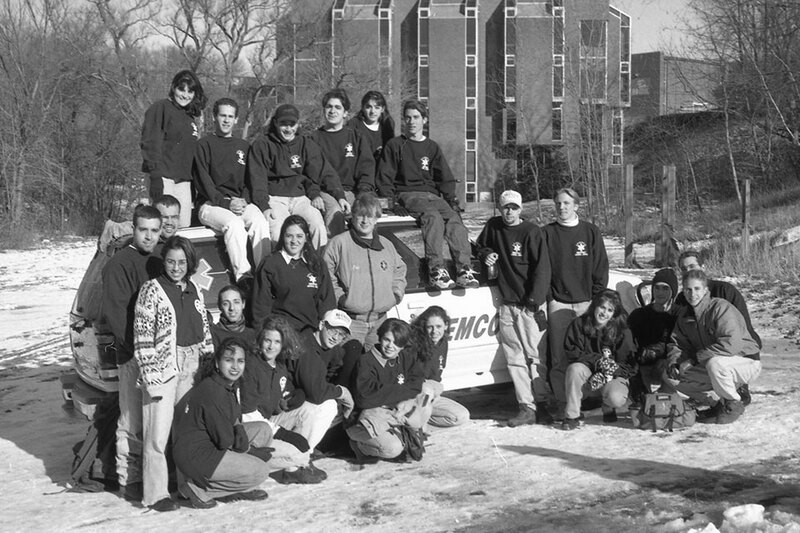 The Brandeis Emergency Medical Corps (BEMCo) was established in 1983 by then undergraduate Jim Meisel, MD. At its formation, BEMCo was a fly-car (quick response vehicle) service, capable of basic life support and non-emergent transport. In 2006, BEMCo was upgraded to a Massachusetts Certified Class V Ambulance. With this certification, BEMCo was able to carry life-saving drugs, such as albuterol, aspirin, and epinephrine, thus providing an even greater level of care to the Brandeis University campus. Today, BEMCo provides first response emergency medical care to Brandeis community members. Our fully stocked emergency vehicles are Massachusetts certified disaster vehicles and carry all of the equipment and supplies of Basic Life Support ambulances. BEMCo has had more than 900 members, all of whom have served the Brandeis University community with tremendous pride and professionalism. At the 2011 National Collegiate EMS Foundation Conference, BEMCo received the Striving for Excellence in Campus Emergency Medical Services award for its outstanding service record, which it maintains to this day. In the 2018-19 school year, BEMCo reached 9,600 emergency calls, and continues to make strides for further improvements. At the 2016 National Collegiate EMS Foundation Conference, BEMCo received the HEARTSafe Campus award. All our members are Massachusetts-Certified Emergency Medical Technicians.